"The purity and beauty of her sound left the audience and him speechless"
"Sha showed herself , not surprisingly, to be a formidable interpreter of the music, with wide range, deep feeling and powerful expression. From subtlety where the bow barely touched the strings to a real passionate stroke she controlled her instrument completely. 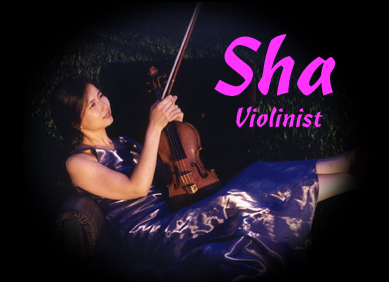 Sha told the tragic love story, not only with the expression in the music but with her whole body language." "Beautifully rendered lines that come directly from the heart"
"On stage her beauty was like an angel come to earth. When her bow touched the string, the sound came straight from heaven"
"Only when you hear Sha play ‘live’ in the concert hall will you understand how powerful and touching the music can be"